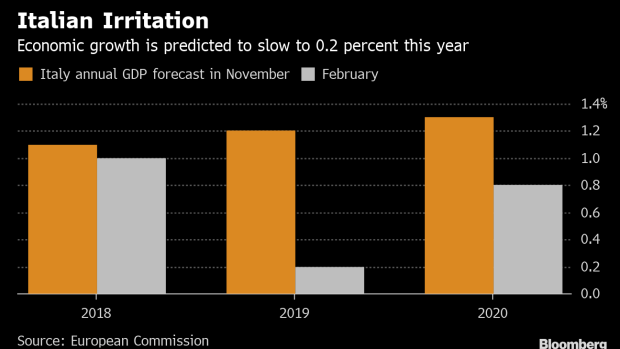 (Bloomberg) -- Italy’s promise to meet ambitious budget targets is being met with growing skepticism by the euro area, after the country slipped into recession at the end of last year. For some peers, meeting these targets could even require divine intervention. “I’m a Catholic, so I believe in miracles, and that keeps me calm, even when it comes to Italy’s ability to deliver on its deficit-reduction target," Slovak Finance Minister Peter Kazimir said in Brussels ahead of a meeting with his peers from the currency bloc. Italy isn’t formally on the agenda of Monday’s meeting. Rome’s populist government is facing renewed criticism of its economic policies after new signs of a slowdown fueled speculation that additional measures would be needed to spur growth and contain the deficit within the European Union’s budget rules. The latest warnings come after the European Commission cut its 2019 growth forecast for the country to 0.2 percent from an earlier projection of 1.2 percent, the lowest among the euro zone’s 19 members. The lowered outlook comes two months after Rome and Brussels reached a compromise over Italy’s deficit target following protracted negotiations. The Italian government initially sought a higher target, which rattled the euro area and helped make Italian bonds among the worst-performing securities of the region last year. "During our negotiations, the Italian authorities corrected the fiscal trajectory quite substantially but the damage to the economy has been already done," European Commission Vice President Valdis Dombrovskis said ahead of the Brussels meeting on Monday. "Now it’s important that Italy continues to stick to responsible fiscal policies in order to allow the economy to rebound." Concerns about Italy’s growth and deficit targets come amid signs of broader weakness in the euro area. Several finance ministers warned that countries including Italy should do their homework and bring their finances in order as mounting data point to a persistent slowdown in the bloc. "There is a concern about many countries," Austrian Finance Minister Hartwig Loeger said on his way into the meeting. "What I see as the most important factor is that there are many countries who did not use the upswing to consolidate their budgets," he said, adding that Italy was among them. Dutch Finance Minister Wopke Hoekstra said it was important that countries took steps to ensure their economies were strong before the tide of the economic cycle turns. "We see that there is less growth in a number of countries and that makes it all the more important to make sure that we use the time that we have to balance our budgets and push through for reforms," he said. --With assistance from Joao Lima and Lyubov Pronina.